Synchronized announcements on September 17 by President Barack Obama and Defense Secretary Robert Gates that the U.S. was abandoning plans to station interceptor missiles in Poland and a forward-based missile radar site in the Czech Republic are now ten days ago and information surfacing in the interim indicates that its new plans are more far-reaching than their predecessor. Two days after the statements by the American president and defense chief the latter, Pentagon head Robert Gates, was granted a column in the New York Times. The new deployments, which will be examined in depth later, are to be more mobile and less capable of being anticipated and defended against; will be implemented, according to Gates’ own schedule, at least eight years ahead of the prior plan’s timeline; and will extend worldwide missile interceptor networks into far broader swathes of Eurasia, the Middle East and ultimately the planet as a whole. The new system, in addition to being more effective and quickly operationalized, will be much grander in scope and will include several times as many missiles as those intended for Poland, although that nation will still host different variants of medium-range interceptor missiles and, as Gates states below, will still eventually station long-range ground-based missiles. Scores means some multiple of twenty and one of America’s top military commanders has mentioned 100 as a starting point, as will be seen later. SM-3s are the missiles employed by the U.S.’s Aegis Ballistic Missile Defense System, which is a sea-based anti-ballistic missile interception program designed to be based off the coasts of targeted nations as needed to render ineffective those nations’ missile launch capabilities, both offensive and defensive. They are also an integral component of the Pentagon’s Proliferation Security Initiative (PSI), a U.S.-led 90-nation international naval surveillance and interdiction project inaugurated by John Bolton in 2003 ostensibly to “interdict weapons of mass destruction” by confronting non-PSI nations’ vessels anywhere in the world. SM-3s are also to be a staple item for America’s “thousand-ship navy,” first proposed by the then U.S. Navy’s Chief of Naval Operations Michael Mullen, now chairman of the armed forces Joint Chiefs of Staff. 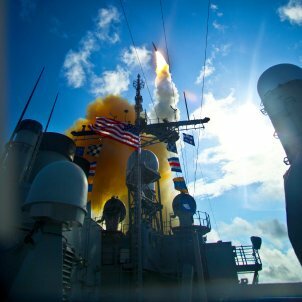 As part of these plans for a U.S.-dominated worldwide navy with missile interception at its core, the United States has already recruited NATO and Asian NATO allies like Norway, Spain, Japan and South Korea into the Aegis combat system with its SM-3 missile shield capacity. India is slated to be the next partner. Robert Gates also mentioned the application of SM-3s for ground use and the Pentagon will now base them both on land and more extensively at sea. It was an SM-3 fired from an Aegis class cruiser, the USS Lake Erie, that destroyed a satellite in outer space in February of 2008, to provide an indication of what its next phase mission will be. The updated missile system plan for Europe is also to be more fully integrated with America’s allies in the North Atlantic Treaty Organization to provide an impenetrable layered shield throughout all of Europe and North America as well as moving into the Middle East, the Caucasus and beyond in the imminent future. NATO remains committed not only to the advancement of a continent-wide missile shield but to the basing of U.S. nuclear weapons in all corners of Europe and their first use, even against non-nuclear powers. To confirm Makarov’s contention, on September 24 Vice Admiral Richard Gallagher, deputy commander of the Pentagon’s European Command [EUCOM], which shares a top commander and in other ways overlaps with NATO, spoke of the new U.S. missile shield system and characterized it as possessing “The intent…to use sea-based defence which, of course, has great flexibility as those ships can be moved to many different locations which gives us very good…ability to employ.” Speaking on behalf of the bloc the U.S. dominates, he added that NATO “has not abandoned the missile defence discussions” and “from the U.S. perspective, you have not seen a change in desires to protect the region and to work in conjunction with NATO as well”. Gallagher was speaking on the sidelines of a conference in Montenegro of the U.S.-Adriatic Charter, an initiative first launched by then Secretary of State Colin Powell in 2002 to militarily integrate and absorb all the nations of former Yugoslavia and the entire Southern Balkans. Although he formally disavowed plans first leaked by the Polish daily Gazeta Wyborcza in late August for the Pentagon to shift its missile shield focus from Poland and the Czech Republic to the Balkans as well as to Israel and Turkey, Gallagher was officiating over a meeting to complete NATO’s incorporation of an area that will be a choice location for American and NATO missile system deployments in the near future. The Adriatic Charter’s first accomplishment is to have added Albania and Croatia as NATO’s 27th and 28th full members earlier this year and it is now grooming Macedonia, Bosnia and Montenegro – the world’s newest nation – to follow suit. Serbia and Kosovo are next in line. Kosovo, not recognized by over two-thirds of the world’s nations and as such not subject to international treaties and constraints, would be an ideal site for U.S. and NATO military deployments of all sorts, including missiles and radar. It’s worth recalling that Vice Admiral Gallagher, as deputy commander of EUCOM, is not a NATO but a Pentagon official, yet is instrumental in recruiting several of the European nations not already Alliance members into the bloc. His superior, Adm. James Stavridis, who is both head of U.S. European Command and NATO Supreme Allied Commander, was also present at the conference in Montenegro. All five Adriatic Charter states – Albania, Bosnia, Croatia, Macedonia and Montenegro – have provided NATO with troops for the war in Afghanistan. Other top American military commanders have also corroborated the claims by President Obama and defense chief Gates that the U.S., far from retreating from missile shield plans, is escalating them in range, depth and effectiveness. The director of the Missile Defense Agency, Lieutenant General Patrick O’Reilly, recently stated that “We are not scrapping missile defense. Rather, we are strengthening it and delivering more capability sooner.” O’Reilly is in charge of the Pentagon command that is most immediately in charge of developing the global missile shield and his words carry corresponding weight. Note that his expression that the Pentagon is not scrapping but strengthening interceptor missile plans is identical to that used by his chief, Defense Secretary Gates, in the latter’s New York Times column. His briefing also included the observation that “The new architecture keeps plans for a radar station in Southeastern Europe, but would also track radar by satellite and ships. Land-based missiles would be deployed at two sites, one in northern Europe and another in southern Europe. On September 25 a column appeared in the Washington Post titled “Reagan’s Missile Defense Triumph” by Andrew Nagorski, vice president and director of public policy at the EastWest Institute in New York. The feature celebrates U.S. global missile shield plans, particularly the innovations announced during the past ten days, as a realization of former President Ronald Reagan’s infamous Strategic Defense Initiative, popularly known as Star Wars. “[A]n anti-missile shield on Poland’s and the Czech Republic’s territories – and anti-missile radars on Georgia’s territory – would have decreased the nuclear capabilities of those countries already possessing nuclear weapons. The Pentagon’s goal was precisely to downgrade the nuclear potentials of individual countries…. “America can push Russia either on Iran or another issue of concern, so it’s very similar to what it was during the last days of the Soviet Union when America was playing with the ABM system being developed. The Anti-Ballistic Missile Treaty was signed in 1972 by the U.S.’s Richard Nixon and the Soviet Union’s Leonid Brezhnev, and the George W. Bush administration unilaterally withdrew from it in 2002. The first threat to the treaty, though, was the Reagan administration’s Strategic Defense Initiative. In both instances U.S. missile shield – and space war – policies are designed among other purposes to place Russia at a strategic disadvantage in regards to negotiations over nuclear weapons and delivery systems. To compound the threat, the U.S. hasn’t even renounced plans for missile deployments in Poland, as Missile Defense Agency chief O’Reilly informed the U.S. Senate on September 24. U.S. Secretary of State Hillary Clinton was even more blunt in a column she wrote for the Financial Times a few days before. Clinton mentioned in particular American military commitments to fellow NATO states, especially Poland and the Czech Republic, and as Obama had done on September 17 invoked NATO’s Article 5 military assistance clause, fraught as it is with the prospect of nuclear confrontation and even war. Western media accounts over the past ten days have been replete with a steady refrain that Czechs and Poles feel “betrayed” by the new U.S. missile plans. Such claims are easily enough refuted by surveys demonstrating that 70 percent of Czechs and 55 percent of Poles were opposed to the deployment of third position missile shield installations on their soil. But to the West the only Czechs and Poles whose opinions are worth considering are U.S.-trained subordinates, like Poland’s Sikorski, at the beck and call of their masters in Washington and Brussels. Residents of the Polish village of Redzikowo where the Pentagon was to place ten ground-based missiles were exuberant over the news that their homes might not be turned into ground zero in Europe’s first missile exchange. National Security Adviser Jones, a retired four-star Marine general, was top military commander of NATO in Europe and the Pentagon’s European Command from 2003-2007 during the initial crafting of Star Wars plans for Eastern Europe. It is not only Russia’s northwest border that will be affected, though. Last week a conference was held on Georgia’s neighbor to the east, Azerbaijan, in Washington, DC. “The plan to scrap missile defence in Eastern Europe could shift the geostrategic balance of power in the Caucasus…. [M]issile defence has not been scrapped, as critics claim. Indeed, missiles are still going to be deployed in Europe, as well as at sea, and will actually be deployed earlier than under the Bush-era plan. “Georgia…hopes the hunt for more effective bases for missile defence may increase its importance. A Washington Post article of last week entitled “Israel Finds Strength in Its Missile Defenses: Advanced System Could Alter Strategic Decisions in Region” offered more details on interceptor plans for the Middle East, ones underway long before Washington’s September 17 revelations. “Israel and the United States [will conduct] a joint, biennial missile defense exercise, called Juniper Cobra, to work on integrating the weapons, radars and other systems of the two countries. The Middle East, the Balkans, the South Caucasus and the Baltic Sea region aren’t lone in being intended sites for the expansion of American global missile shield deployments. The Korea Times of September 22 confirmed that the plans are indeed international in reporting that “a local news report that the U.S. administration of President Barack Obama may ask South Korea to join the missile shield initiative despite its recent modification of the BMD [Ballistic Missile Defense] plan. “The report cited a report written by the Missile Defense Agency affiliated with the U.S. Department of Defense, describing South Korea as one of the nations to potentially join the BMD effort. For anyone hoping that the threat of unilateral actions by the West to make itself resistant to missile attacks, conventional and nuclear, while rendering the rest of the world defenseless and thus fair game for first strikes was diminishing, this report should clarify matters. On September 25 NASA (National Aeronautics and Space Administration) launched a rocket carrying two experimental missile-tracking satellites for the Missile Defense Agency. Reports that the White House was effectively merging what is technically the civilian NASA with the Pentagon’s Missile Defense Agency for missile interception and space war purposes have circulated since the current American president’s election victory last November. The process now appears well underway. To tie together two threads in the U.S.’s new generation missile shield program, it was reported that “The STSS satellites follow NASA’s launch of another missile defense satellite – the STSS Advanced Technology Risk Reduction spacecraft – in early May. Former plans for interceptor missile facilities in Poland and the Czech Republic, employing as they were to have antiquated technology, have been superseded by new projects that will encompass broader regions of the world and will coordinate deployments on land, at sea, in the air and in space.